The human brain is a funny little computer, made of squishy bits and spark plugs. Those squishy bits like to group together and form what more educated adults will tell you are "neural pathways." These pathways contribute to our perspective. About everything, really. The brain doesn't like to work hard, so it will naturally take the path of least resistance. Coincidentally, that also happens to be the path we tread the most. Pessimistic? Your brain made a smoothly paved road of gloomy tar for that perspective. Optimistic? Your grey matter has been happily slathering gold over that foot path. Generally ambivalent? Like me, your myelin sheath is probably thinner than sewing thread. Tightrope time. The brain is a remarkably elastic web of sticky myelin threads and while it's not easy, it is definitely possible to flatten the weeds on a new neural pathway. In other words, you can learn to change your perspective. Okay, now that you've chosen your "perspective" - think about why you choose that one. Why do you see your life in that way? Is this a new feeling or one you've always had? How does that choice speak to you? Now, pick another one that also feels true for you. What did those two "perspectives" have in a common? Were they wildly different? Now for the hard part. I want you to choose a "perspective" that does NOT feel accurate for your life. Why did you choose that one? And, if you really stop to think about it, is there something in that "perspective" that might actually be true for you? Could you shift your way of thinking to find the positive way this new perspective could relate to your experience of life? It's not easy, is it? Because the brain wants to take the path of least resistance, but every time you challenge the way you think and how you feel about something, you are creating and strengthening new pathways in your brain. I'm going to play too. 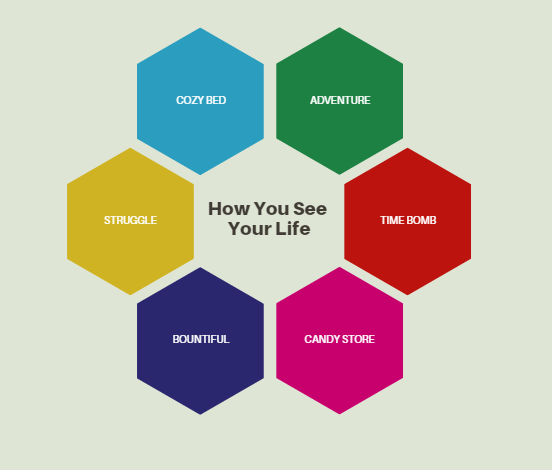 Looking at my wheel of options, when I think about where I'm at in life right now, the "perspective" that feels most comfortable and natural for me is STRUGGLE. I feel that I've had a lot of hardships in my life and that I'm always fighting to keep my head above water. It's not a comfortable place to be. But I've gotten comfortable viewing my existence in this way. A "perspective" that doesn't feel accurate to my life is BOUNTIFUL. But if I shift my way of thinking and stop to consider ways that my life is, in fact, bountiful - I can see that I do have a lot of privileges in life and opportunities that I could be taking advantage of if I could just shift my way of thinking and where I direct my energies. And this is so important to understanding how our own minds work and being aware of the ways we have been conditioned (and conditioned ourselves) to think. 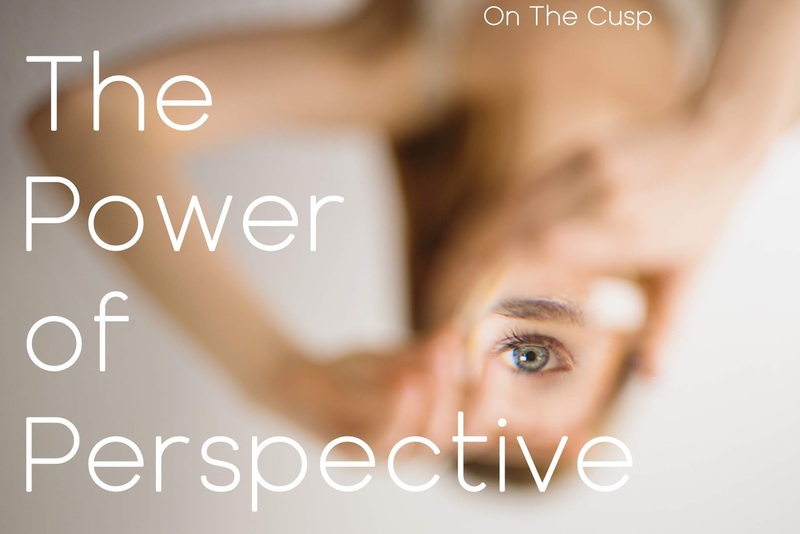 It also allows us to more easily consider the perspectives of other people and to realize that they, too, are coming from a place of mental conditioning. Understanding why others think and believe and behave the way they do is the first step to overcoming barriers. If we can challenge our own perspectives and learn to see things from a different angle, we are better equipped to listen with empathy and compassion. We are better equipped to respond to the needs and struggles of others. And we are also more understanding of our own needs and struggles. Y'know, at the end of the day it doesn't really matter whether or not the cup is half full or half empty. We all have a cup and we should be able to fill it (or not) with whatever we choose. Thanks for the informative post. I've been researching ways to alter mental perspectives for a few years now and I'm starting to feel a shift though there's still a ways to go. Unfortunately, I still identify the most with struggle when adventure is where I want to be. It definitely takes time and practice to change thinking patterns, that's for sure!